I was going to post this example of commemorating a physician in an opera after Dr. Bert Hansen’s excellent talk on how Life Magazine honored members of the medical profession via photography, but this post also fits in with our examination of songs. In any case, a while ago we were privileged to attend a performance of an opera-in-progress entitled “Semmelweis” at the New York Academy of Medicine. The composers of the opera, Ray Lustig (music) and Matt Gray (words) are writing the opera under the auspices of the Brooklyn-based American Opera Projects and they have chosen a terribly sad story to tell. 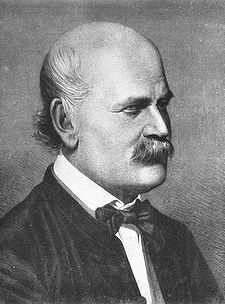 If you are like me, you’ve never heard of Ignaz Semmelweis, but he certainly deserves to known and esteemed for his ground-breaking work that was never honored (and actually sneered at) during his lifetime. Ignaz Semmelweiss. 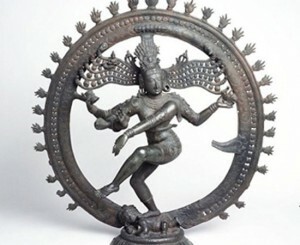 Image from Wikipedia, click for source. Semmelweis was born in 1818 in Hungary to German Jewish parents. He graduated from medical school in Vienna in 1844 and became an obstretrician at a prestigious teaching hospital there. There were two maternity clinics at the hospital. 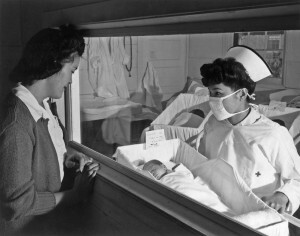 At that time, many women died after childbirh from puerperal (“childbed”) fever. Women who gave birth in Clinic One were attended by physicians and medical students and women who gave birth in Clinic Two were attended by midwives and their students. Semmelweis noticed that the mortality rate for women in Clinic One was very much higher than the mortality rate in Clinic Two, In fact, women who gave birth outside in the street had a lower mortality rate than the women who delivered with the help of the doctors. The discrepancy bothered Semmelweis and he began keeping statistics on all sorts of factors in an attempt to discover the reason why more women were dying in Clinic One. The only difference he could find was that the doctors and medical students would go directly from conducting autopsies to delivering babies without washing their hands. No one knew from germs back then but Semmelweis conjectured that there was something about the cadavers that was causing the childbed fevers. He believed “cadaverous particles” that he could smell were causing the deaths. 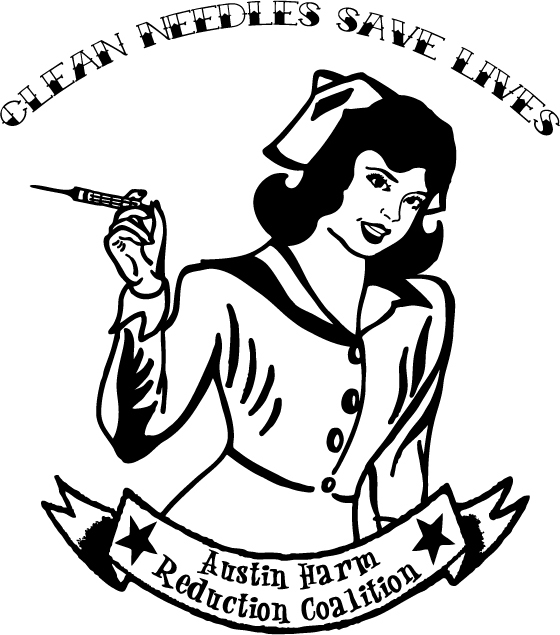 So, Semmelweis instituted a new policy that required attending physicians to wash their hands with bleach before they delivered babies and sure enough, the mortality rate in Clinic One dropped by 90% . Semmelweiss making doctors wash their hands. Click for source. Sadly, many doctors disagreed with Semmelweis’ theory and ignored or even ridiculed him. Part of their problem was that they refused to believe their highly educated hands could carry anything harmful and part of their disdain was because they just didn’t like Semmelweis who wasn’t sophisticated – he was a Jewish foreignor who spoke with an accent and so they discounted his ideas. By 1850 the hospital effectively forced him out and Semmelweis moved to Budapest where he took a much less prestigious job at a hospital there. He reduced the really high rate of childbed fever there to less than 1% of birhs. Still, most doctors refused to wash their freaking hands. Semmelweis became depressed and obsessed with reducing the rate of childbed deaths. He wrote some Open Letters to prominent European obstreticians in which he essentially accused them of murdering women with their irresponsible behavior. Semmelweis was rightly peeved but his behavior became erratic. He was drinking and staying away from his family and when he turned 47, a colleague lured him to an insane asylum and had him locked up. 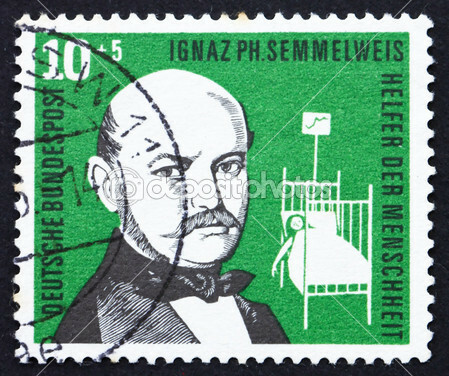 Poor Semmelweis tried to escape and the guards beat him so badly that he died of an infection two weeks later. There is even a psychological reaction called the “Semmelweis Reflex” which Wikipedia defines as “a metaphor for a certain type of human behavior characterized by reflex-like rejection of new knowledge because it contradicts entrenched norms, beliefs, or paradigms”. After we enjoyed the wonderful opera (and to be honest I’m not usually a fan of the genre), some physicians in the audience talked about the dismal maternal mortality rates in modern day New York City. Maternal mortality rates here are 30% higher in 2013 than they were ten years ago and the racial disparities here are shocking, Only three states in the US have worse maternal mortality rates than New York. Semmeweiss would be rightfully horrified. Just a friendly reminder that one of our team members, Professor Shauna Vey will be giving a talk tomorrow Thursday, November 14, on her research on nineteenth-century child actors in Atrium 631 at 1:oo pm. I found the form for proposing a new interdisciplinary course on the College Council website under the Curriculum Committee’s Major Modifications button. It is daunting. I am working on my portion of the Weekly Course Outline (3-5 weeks depending on what we decide) on the right to die, patient autonomy, living wills, dnr orders and health care proxies, as well as how various cultures mourn and commemorate their decedents through the fine arts (incorporating a trip to a museum, case law, a film(?) and a novel). This form is used for all new course proposals. Attach this to the Curriculum Modification Proposal Form and submit as one package as per instructions. Use one New Course Proposal Form for each new course. Provide a concise summary of why this course is important to the department, school or college. If this course is intended to fulfill one of the requirements in the common core, then indicate which area. Please include all appropriate documentation as indicated in the NEW COURSE PROPOSAL Combine all information into a single document that is included in the Curriculum Modification Form. Use this checklist to ensure that all required documentation has been included. You may wish to use this checklist as a table of contents within the new course proposal. Include within the outline the following. Describe the need for this course. Include in your statement the following information. Target Students who will take this course. Which programs or departments, and how many anticipated? Documentation of student views (if applicable, e.g. non-required elective). Projected headcounts (fall/spring and day/evening) for each new or modified course. If additional physical resources are required (new space, modifications, equipment), description of these requirements. If applicable, Memo or email from the VP for Finance and Administration with written comments regarding additional and/or new facilities, renovations or construction. Where does this course overlap with other courses, both within and outside of the department? Does the Department currently have full time faculty qualified to teach this course? If not, then what plans are there to cover this? If needs assessment states that this course is required by an accrediting body, then provide documentation indicating that need. Describe how this course is designed. Course Structure: how the course will be offered (e.g. lecture, seminar, tutorial, fieldtrip)? How does this course support Programmatic Learning Outcomes? Is this course designed to be partially or fully online? If so, describe how this benefits students and/or program. If course originated as an experimental course, then results of evaluation plan as developed with director of assessment. Plan and process for evaluation developed in consultation with the director of assessment. (Contact Director of Assessment for more information). Just a quick note to tell you that NYT writer David Bornstein has been writing about burnout in healthcare, and the different ways health professionals have been seeking meaning in their work. His latest commentary “Who Will Heal the Doctors” was published Oct 2nd, 2013. Bornstein’s series is rather doctor-centric but as I read it, I couldn’t help but think how many of the issues he brings up is pertinent to all who work in the healthcare field. In this latest article, Bornstein mentions a course called The Healer’s Art that helps students and doctors reconnect to the deeper meanings of their work. I looked at The Healer’s Art website and they have courses geared to work with all healthcare professionals. 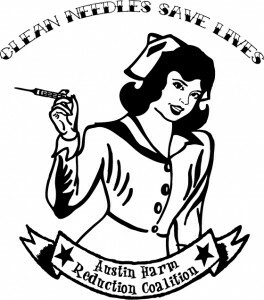 You can look at their program for nurses here. Off the website, the course covers topics including “deep listening, presence, acceptance, loss, grief, healing, relationship, courage, lineage and self-care practices.” We have spent a lot of time on the importance of observation and the need for careful looking. I was glad to see the importance given to listening, in particular deep listening, a form of communication that our students should be trained in to promote greater empathy with their patients.